Eleven artists were represented at the “Popular Image Exhibition” at The Washington Gallery of Modern Art. In addition to Warhol these included Tom Wesselmann, Claes Oldenburg, Jim Rosenquist, Robert Rauschenberg, Jim Dine, George Brecht, Jasper Johns, Roy Lichtenstein, John Wesley and Robert Watts and each was interviewed about his contribution. The interviews were collected on an LP with a cover design my Jim Dine and sold at the exhibition. Warhol took some of the LPs and put them in his cover. The exact number is unknown, however, probably not in all 75 of them. 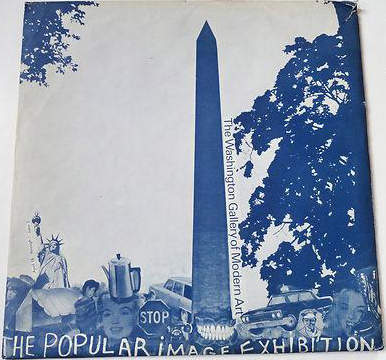 Some copies of the record in the original Washington Gallery cover have turned up for auction and some copies of the “Giant Size” cover with record have also been sold. In 1971, Warhol remade the record covers – this time in three series with spray painted backgrounds, 75 copies each on red, green and yellow backgrounds. I have seen at least one red copy sold with the LP from the 1963 exhibition. 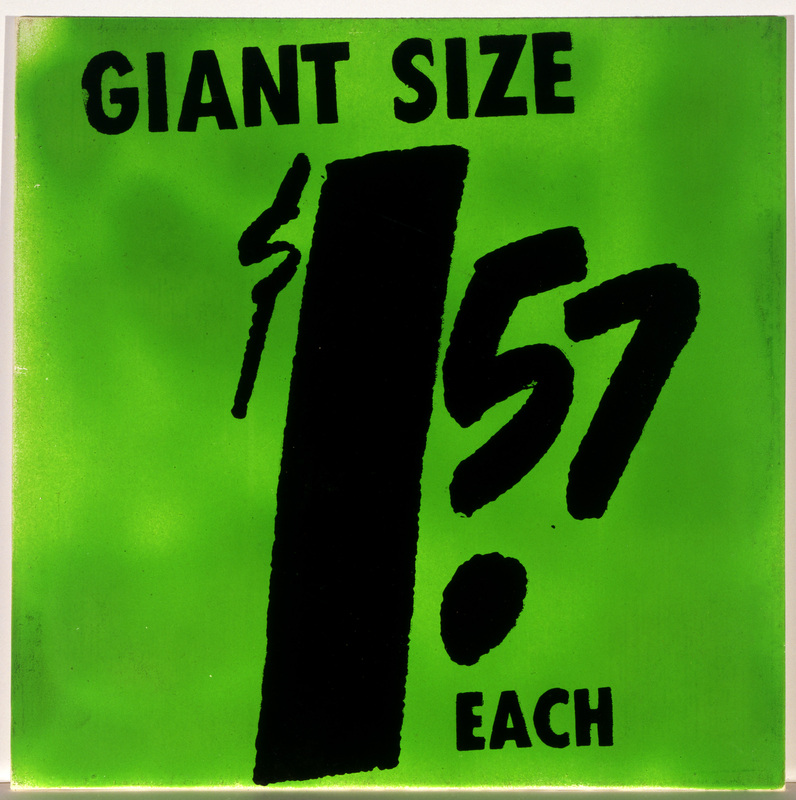 According to Paul Maréchal, Matt Wrbican at The Warhol Museum discovered a bundle of seventeen “Giant Size $1.57 Each” covers in Treasure Chest box 63. When I was curating the “Happy Birthday Andy Warhol” exhibition in 2008 I made 10 digital copies of the “Giant Size $1.57 Each” cover to be sold at the exhibition. In addition I made three copies of each of the red, green and yellow covers (however, my yellow turned out more ochre than yellow). 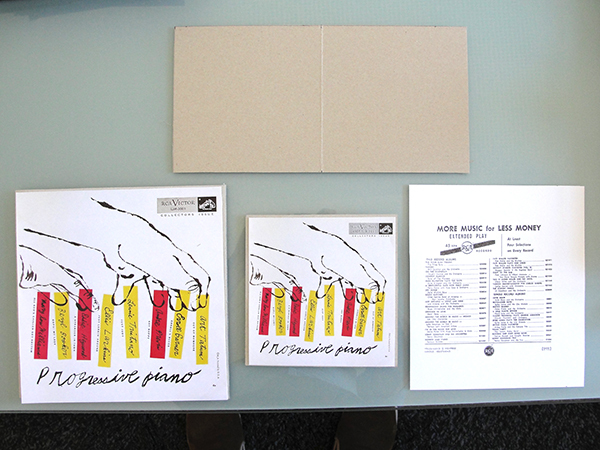 The 10″ and 7″ versions of “Progressive Piano” and the cover in progress. The picture shows the basic card cover for the 7″ version open. Under it is the card cover with the cover image superimposed. The 10″ version is shown on the left and the rear cover for the 7″ version on the right. I have invented a rear cover for the 10-inch album as every RCA album has an individually scripted rear cover. The most difficult part of the production of these covers has been finding the correct thickness card for the covers. Record covers nowadays are constructed of card that is considerably thinner than that used in the 1950s. Most card currently available is 1 mm thick or thicker and cannot be used for making a replica record sleeve. I had a stoke of luck while getting som photocopies made at a copy shop. They packaged my copies in an envelope with a cardboard back of exactly the right thickness for a record cover. This could be cut to size for the 7-inch covers. However, I still had to find larger sheets of card to make the 10-inch cover. As luck would have it, I found some special card in an art shop in central London that exactly fitted the bill. The process nears completion. All that remains is to glue the rear cover art to the ready-cut cards and then glue over the front design to complete the covers. I feel a bit sad that a project that has been in gestation for four or five years is so near its conclusion. I will need a new project to deal with. WOW, I never knew about this, and here I thought the only album cover he had ever done was the Velvet Underground. Hi Richard, great post as always. The album looks amazing, i love this DIY stuff, very inspiring! Do you have any information on the Night Beat album? Have you or any other collector ever seen it “in the flesh”? I’m always interested in info on “Giant Size”! My email address is sthlm.forrest@gmail.com. Hello, unfortunately I’m unable to find any contact information for you in this Word Press but I have some information in regards to the Giant Size $1.57 that you may be interested in. Please reach out to me at QuinnMintrup@hotmail.com. Thank you for your time.